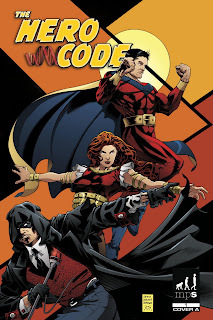 The Hero Code is a book that was successfully funded through Kickstarter, though I have to admit that completely escaped my notice until author Jamie Gambell graciously sent me a copy of the first issue. The main story starts with some crooks trying to escape the police. The superhero Optiman intercedes and apprehends the criminals after getting blasted several times with a laser cannon. A pair of adults siblings discuss the sudden appearance of so many super-powered humans while watching a newscast of Optiman's heroism. They decide he isn't related but might well prove to be a useful ally. Meanwhile, crime boss Disalvo Lafontaine gets upset that the goons shown on TV had gotten a hold of one of his cannons, and suggests a "visit" to its inventor, who is busy seemingly grander experiments. At the policeman's ball, the Commission tries to avoid discussing this Black Wraith vigilante with other guests, just as the Wraith goes about mopping up a robbery across town. A mysterious figure watches the three heroes on monitors and imagines that finding out if those three will be "enough" will be fun. The three heroes in question are fairly obvious stand-ins for Superman, Wonder Woman and Batman. Or at least the archetypes those DC heroes generally embody. There's not a lot of time for elaborate characterization, so it's hard to say at this point how original these new characters are, or how deep they are as characters, but I was pleased how they were introduced -- each given his/her own different entrance without a cumbersome origin story off the bat. I particularly liked how Black Wraith (and his secret identity) are introduced -- very smartly handled. Though I did think the Wonder Woman stand-in could have used a bit more attention. It was a nice set-up and did a good job of providing an overview of the world we're looking at, but it didn't say anything really about her; we don't even learn her name. Gambell has some lofty ambitions here. According to the issue's afterword, "The Hero Code is simply a comic book in which the good guys prevail." I think that sells the intentions a bit short, though. By making some immediate comparisons to DC's trinity, it does allow readers to follow the story premise quickly without a lot of exposition, but it also suggests the launch of a new superhero universe. There's nothing to say that can't be done, but that's not an easy task either, as evidenced by the string of unsuccessful publishers over the decades who have tried exactly that. Now, that may not be the case here -- we're only looking at one issue, after all -- but they brought up the DC comparison in the first place and additional comparisons are inevitable. With that said, though, Gambell's actual story is solid. Good dialogue and natural-sounding exposition. He also knows when to hold back and let the artwork speak for itself. Artist Jonathan Rector turns in some nice work, which I'm sure makes that easier. Excellent linework throughout, and good storytelling chops. No wasted space with gratuitous splash pages or anything. The book looks to be off to a good start. I think the second and third issues will really be telling with regards to how good the story is, overall. If Gambell and Rector keep are able to keep on with what they're doing, this would make a handsome TPB or hardcover down the road. The first issue can be purchased in print from Monkey Pipe Studios or online from Graphicly.